Yes, I was over the moon when I set this book on the dining table and the yellow tulips picked up on the yellow specks dotting this cover. This sort of thing makes me deliriously happy. A happy coincidence. Now onto the 40th anniversary edition of this groundbreaking book. Olney is credited with being the person most responsible for the ‘prepare/cook/assemble what is freshest at the moment’ movement that inspired the likes of Alice Waters. She credits Olney with being one of her greatest sources of inspiration. Cooking with the freshest local ingredients is such a part of our cooking conscience today, so it is fascinating to look back at what and how Mister Olney approached it in this book. Of course, that is how many French have cooked for ages, but this book really put that concept into the mind of Americans. With a new foreword written by the uber talented Mark Bittman, who I adore. 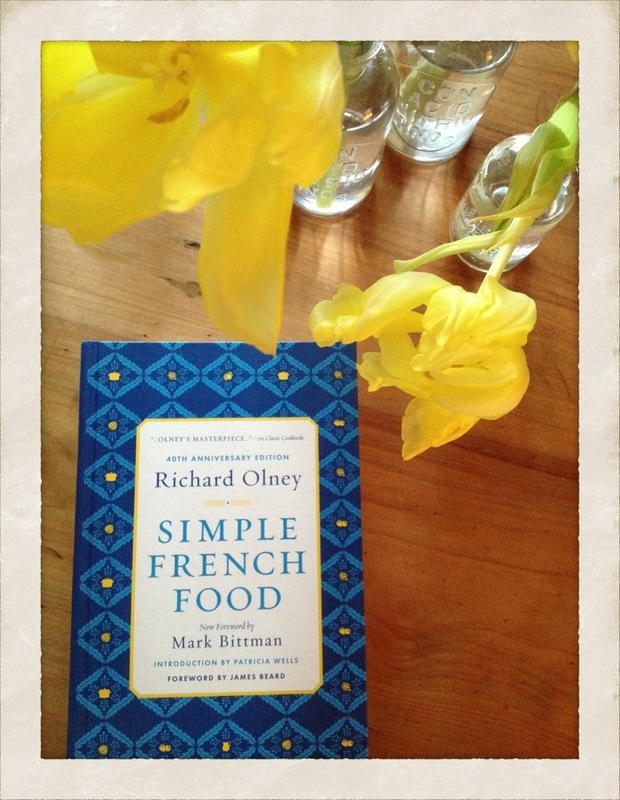 Along with the original foreword by James Beard, this book has become a classic and is now once again out in the world for many new folks to be introduced to the genius that was Richard Olney.